The boys are testing this week. Testing to see not only what they know, but how well they have been taught. Those in the schools…well, the teachers are being tested as well. I know in some areas these tests bring stress and anxiety and frustration; there is pressure to do well. I told the boys not to worry and to have fun. I told them I’m not worried a bit…I know they are bright and I know they are learning, and I know this year will be a bit different since we began homeschool. We are using a different curriculum, and I know that will show, especially in math. They are relaxed and they are not worried about the results, although they know I expect them to do their best. Yesterday I saw a video and it has been on my mind since. See, I know there are loads of opinions on education, and I know that not one way is necessarily the correct way for everyone. We’ve chosen homeschool for this season, and we have done so for a number of reasons. I am excited about this venture, and I am hopeful. I truly think this is the best option for us, and I think there are some opportunities in the homeschool arena that simply can’t happen in the classroom. Opportunities to pause the syllabus and explore. That is a touchy issue because some people feel judged just by my saying that…my choice for our family can frustrate others who have not made the same choice. Some think that I am making a statement about public education or private education…and I am, to some degree. Still, because I have found our niche and am celebrating that does not mean that another’s choice is worse. I have friends who have children flourishing in public school and friends with children flourishing in private school. Here is the real thrust of my thinking, though, and here is where this video comes into the discussion. My kids, all boys at this point for the discussion of education, get bored easily. They are not avid readers or avid ‘learners’ and there are many days in the classroom or at home where they just want to get through the material so they can get on to something fun. I love to learn, and I love education. I know I didn’t always…but I have found that I love learning about people and about places…I love reading and I love learning new things. I want them to catch that. I want them to see learning as something vital and alive and filled with wonder and imagination and truth…and not drudgery. It can be drudgery in the classroom, in the home, wherever. The same education can be exciting and grab our attention…in the home or in the classroom. I am not completely sure how this will play out, but I know that something is stirring in me about how I approach teaching the children. There are still facts they have to learn, and sometimes those facts are drudgery. There will, however, be things that will grab their attention and spark something…and those things need to be given the room to grow and the space to breathe. When something makes them sit up and makes their eyes sparkle and makes them talk excitedly, I need to pay attention. I need to be listening for that moment, and I need to breathe life into that spark. That doesn’t happen in testing. That doesn’t happen in drudgery. That requires attention and the flexibility to give room to that interest. The hope is that as that interest sparks learning, the enjoyment of learning will spread to the other subjects. There has to be room for imagination and for experiments. Space to find out that actually, I don’t care at all about this subject. Testing doesn’t make that room. I am not saying that testing is meaningless; we do need to know that our kids are learning the necessities. I am saying that our kids are so much more than the testing reveals. I love this video because the young man is obviously bright and intelligent and creative and passionate. He is not saying education is meaningless…he is saying to pay attention to that spark and not just learn because you have to learn a set of facts. Give room for that love of learning without suffocating it with facts that become drudgery. I am not good at this yet…I still make it drudgery sometimes. I can remember my teachers who were able to grab my attention and I can remember when the realization began to take hold that learning is really amazing. This is an amazing world filled with some pretty incredibly stories and people and facts and wonders…that is what I want to convey. Check out this video, and thanks to my friend Tina Hunter for posting it, and then watch the one after as well. I want my boys to think like this…I want them to think and to challenge and to explore, not just to prepare for tests. Update: I have to add something, as I’ve been thinking about this through the day. I have to add that I have so much respect for my friends who are teachers…who are able to create an atmosphere of creativity and individuality in the classroom. Those teachers who make our children feel special, who truly care about the children they teach…those are some special teachers! I know that there are many who have made an impact on my kids…and on our family as a result. There are many teachers who are simply tired, and many who are restricted and find themselves in a difficult position to try and create a unique environment. So, I wanted to add that I know there are not simple answers to how we inspire our children…and whether we homeschool or have kids in school, we have to continue the learning throughout our family life. Messy Monday…meet, um, relaxed Monday?! There is a noticeable lack of noise around the house. There are papers missing, and pencils not being sharpened. Books are not being opened and discussions are not taking place. The boys are all gone for testing this week. All three. All day. We are almost done with our first year of homeschool Only three more weeks after this week. The home stretch. I even have completed all the lesson plans through to the end of the year. Actually, more than that. We’ve caught a bit of a groove now, and I know some things that work and some that don’t. I have more of a vision for what our days should look like, and more of an inkling to what I want this homeschool venture to be all about. For us. Because I am well aware this is not for everyone…and it may not be for us all the way through their education. The reality sinks in, though, on days like today when they are absent. 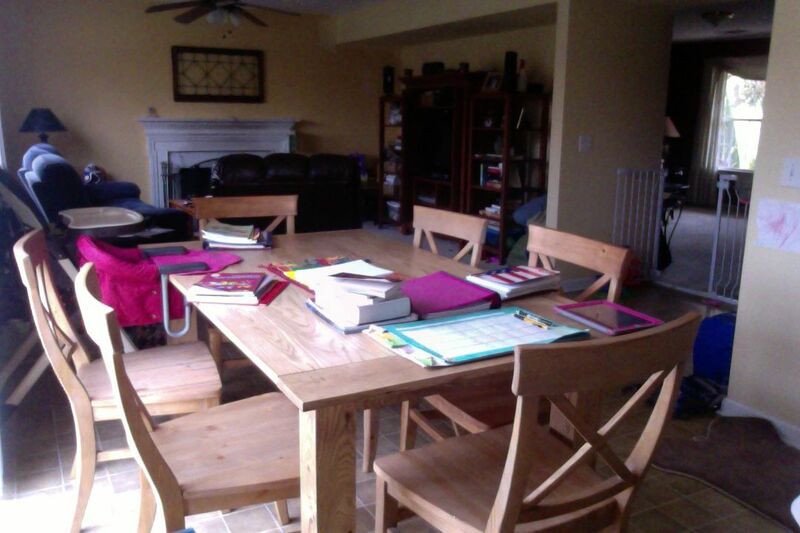 I have become accustomed to the noise and the activity and the life that happens with homeschool. I am the first to admit that I need my space and my time to think and to read and to be alone…if I don’t have that I become pretty grouchy. Those times are much more difficult to find with the kids all home. I am the first to admit how pleased I am that we are doing this…I am surprised how much I enjoy teaching them and being with them. I am eager to see how the next year takes shape as we put some of the things we learned into practice, and as we tweak our schedules a little more. I’m thankful. Thankful for the chance to homeschool and for all the resources. Thankful for friends who don’t homeschool and keep us balanced. Thankful for flexibility and kids who are willing to roll with something new. Thankful for the sunshine…and the chance today to relax a little and catch up on household things that tend to get pushed aside. Thankful for a relaxed Monday. I should be finishing up my housework at the moment. Or finishing up the next chapter in Peterson’s book so we can continue our discussion about REsurrection Life. I keep finding myself distracted, though. I’ll come by the computer in the kitchen and stop to check email or to look something up…and I’ll find thoughts about Boston. Friends are posting their thoughts and their prayers. The picture of 8 year old Martin has caught me a few times. I have prayerd…prayed for peace to settle around that city. You know how ash settles after a fire, or after you blow on a fire…it settles slowly and it is a little fragile. I picture the peace of God settling around the city in that way…slowly, and with a sense of the fragile. Fragile emotions and frayed nerves. Fears and hatred and sorrow…and even hope maybe mixed in. Whoever did this…so very broken. And yet. More than that. There is evil. I try to ignore it sometimes…and sometimes it is easy to do as I hear my children giggle and I hear the birds and see the sunsets…it is easy to ignore that there is evil that not only seeks our destruction but delights in it. Seeks, as the Bible says, like a lion looking for prey to devour. That evil…that deep and dark evil that hates us with passion…that stirred those events yesterday, and delighted in the terror. And we cannot fix that. We cannot ban enough things or create enough safe zones, arrest enough criminals or arm enough armies. We cannot end it completely. We can only keep its physical violence at bay…and we only do that with limited success. That evil…and its hold on our brokenness…that has to be eradicated by something, Someone, stronger than ourselves. I think of the story of another man who hated with passion and who sought destruction. He was held up in his pursuit by others who joined with him. He oversaw executions and ordered others to be doled out by his subordinates. He did all of this with a righteous vengeance….until. Until he was knocked blind by a God who is able to intervene and call us out of the hold of evil and darkness…and change even our name and our identity. The story repeats thousands of times. Whoever set those bombs yesterday…whatever thinking lay behind that attack…the best we can hope for is to find the person and lock them up so they can’t act again. We cannot end the evil. God have mercy….there will be a day when He will end the evil. That is both exhilarating and terrifying. There will be a day when God will say enough. There will be an end to His patience and there will be a culmination to the story. For those of us who believe…there will be peace that will settle in a way we have never known before…with the absence of evil. For those who resist Him and who deny Him….there will not be peace. These are big thoughts. Beyond my imagination, and yet the startling, frightening face of evil that lashed out yesterday reminds me that we are in the midst of the story. We are in the midst of the struggle, and we are hated. That does not ease the pain, I would guess, in this moment for Martin’s father as he waits to see if his wife will survive and how his 6 year old with an amputation will cope. However…as that peace settles more solidly, I pray that the reality of this God who faced evil and obliterated it….this God who will not let evil finally win…this God is real. This is the God we believe upon…and it is in the shelter of His wing we find refuge from the evil. God’s calling us…by name…on purpose. We can understand neither God nor ourselves in any living, adequate, and mature way that is an impersonal, non-relational way. When God’s calling and our walking fit, we are growing up in Christ. God calls; we walk. Eugene H. Peterson. Practice Resurrection: A Conversation on Growing Up in Christ (Kindle Locations 392-393). Kindle Edition. Peterson begins the second chapter by making it clear Ephesians is all about calling. I’ll get more detailed on Tuesday, but thought I would use Fridays to just highlight a thought from the chapter. Again, it is easy to pick up just this one thought and sit with it for a few days. It is not earth-shakingly new. It is not a self-help formula. God calls us. He does not save us in some vapid, generic way…we are not numbers lined up or just a crowd of people. He has called me by name. And You. We are named. Named people who come together to walk into maturity in following God. God speaks the decisive word that puts us on the way, the road, the path of life. The Hebrew word for Bible is Miqra, a noun formed from the verb “to call,” qara. The Bible is not a book to carry around and read for information on God, but a voice to listen to. I like that. This word of God that we name Bible, book, is not at root a word to be read and looked at and discussed. It is a word to be listened to and obeyed, a word that gets us going. Fundamentally, it is a call: God calls us. Eugene H. Peterson. Practice Resurrection: A Conversation on Growing Up in Christ (Kindle Locations 407-410). Kindle Edition. That means there is purpose…there is something to put our hand to. Calling means moving somewhere…it means following. Obedience. Discipline…thinking of my post from earlier today. The rest of the chapter will develop this thought and Peterson will expand on our understanding of calling…and of walking…and of maturing. I’ll post thoughts on the rest of the chapter on Tuesday, and I hope you’ll jump in to the discussion. For now…you are called. On purpose…with meaning…by name. Sit with that for awhile and know that God knows you by name and has purpose for you. Resurrection Life. Living with an understanding and transformation caused by the reality that our God not only came as a human, died…but rose from the dead. All of that is staggering. I know that I do not know this deeply enough in my soul. I’m not sure if any of us ever will completely…but we catch glimpses, don’t we. We have those moments when the reality of eternity sneaks up on us, or grabs our attention…those moments when the reality of following Jesus overwhelms our inadequate minds and souls and we become enlivened in ways we can never manufacture ourselves. Practice Resurrection: A Conversation on Growing Up in Christ. This is not just some formula to set ourselves up to encounter the Resurrection. This is about a life that encounters God and is transformed…into maturity. And for Peterson, this happens only in one way…in the midst of Church. Seriously, I know there are so many who are immediately thinking either that this is going to be boring, or that there is no way this will translate to our actual congregational situation. Some have been bored by the church, some have been annoyed, some have been frustrate, some have been abused. But this, argues, Peterson, is right where we encounter Resurrection Life. Not because of accident…this is God’s design. Maybe the church as we have it provides the very conditions and proper company congenial for growing up in Christ, for becoming mature, for arriving at the measure of the stature of Christ. Maybe God knows what he is doing, giving us church, this church. Eugene H. Peterson. Practice Resurrection: A Conversation on Growing Up in Christ (Kindle Locations 180-182). Kindle Edition. This Church. Named people in a specific place, in specific congregations. This Church. Peterson challenges us to look at the similarity between the coming of our Savior (Luke 1-2) and the coming of our salvation community (Acts 1-2). There are great similarities. In the same way that God could have chosen to come in glory, to come doing miracles that drew enormous crowds and swayed the nations to follow him…he could also have chosen to establish a Church where there was success and where there was power and where the world would want to come. We talk a lot about Christ killed on a cross as a scandal, “a stumbling block to Jews and foolishness to Gentiles” (1 Cor. 1:23). I want to talk about church, this actual congregation that I attend, as stumbling block, as scandal, as absurd. The Holy Spirit could have formed congregations out of an elite group of talented men and women who hungered for the “beauty of holiness,” congregations as stunning as the curvaceous Tirzah and as terrifying to the forces of evil as the army with banners. Why didn’t he? Because that is not the way the Holy Spirit works. We know that is not the way the Savior was brought into our lives. Why would the Spirit change strategies in bringing the salvation community, the church, the congregation, into our lives? Eugene H. Peterson. Practice Resurrection: A Conversation on Growing Up in Christ (Kindle Locations 327-331). Kindle Edition. So, this church with all its inadequacies and all of, well, us. This is the place we are to grow into maturity and to know what it is to walk in Resurrection life. That is, possibly, a little disappointing. I have been involved in fellowships where there just seemed to be a lot of people there because they felt obligated. Or a lot of people who were pretty messed up. Like me. This is the place? Really? Yes, really. Because it is not all about us. Our salvation was not about what we could do or work or accomplish. Our growing up in Christ, being the Church…is not about our abilities. The power of the Church comes from God. but the essence that is behind the appearances: God’s will, Christ’s presence, the Holy Spirit’s work. This, not what we do or do not do in belief and doubt, in faithfulness or betrayal, in obedience or disobedience, is what we simply must get through our heads if we are going to understand and participate rightly in any church that we are part of. Eugene H. Peterson. Practice Resurrection: A Conversation on Growing Up in Christ (Kindle Locations 191-193). Kindle Edition. But the dominant concern in this Ephesian letter is not to deal with the human problems that inevitably develop in church – no church is exempt – but to explore God’s glory that gives the church its unique identity. The letter also gives us an adequate vocabulary and large enough imagination for living in the fullness of God’s glory, living to “the praise of his glory” (Eph. 1:14). Eugene H. Peterson. Practice Resurrection: A Conversation on Growing Up in Christ (Kindle Locations 206-208). Kindle Edition. We are a little handicapped, though…we have actual faces looking at us, and voices talking to us…and people who annoy us or who delight us. People who form our understanding of Church, and it is sometimes hard to separate our marred congregation from the intention of God to use this place to establish His kingdom. When we who follow Jesus enter a church and participate in its life, our understanding of the place and company we are in is strongly conditioned by what we observe and experience in this congregation and its local history, these people with their personal and collective virtues and faults. That means that none of us ever sees the church whole and complete. We have access only to something partial, sometimes distorted, always incomplete. Eugene H. Peterson. Practice Resurrection: A Conversation on Growing Up in Christ (Kindle Locations 213-216). Kindle Edition. Some, as I have come to know through my friend Michael’s blog, have been deeply wounded by their church. Wounding, abuse, disillusionment…these stack up against our seeing the church as something where God is establishing His glory. Sometimes it is hard to think with imagination and wonder when we pull into the parking lot. We have the Ephesian letter before us so that even though we are surrounded with immature and deficient and incomplete churches, we can acquire a feel for what maturity is, what growing up in Christ consists of. By means of Ephesians we get an accurate account of what God is doing and the way the Spirit is working at the heart of every congregation. Eugene H. Peterson. Practice Resurrection: A Conversation on Growing Up in Christ (Kindle Locations 217-219). Kindle Edition. Resurrection life. In the Body. In the Church…in my congregation. Growing up to maturity in Christ…right there, with my rear in a seat and the person next to me bumping into me and the other person hugging me and the other person singing behind me. Those actual people. We are in this together. We are the Body….and we cannot fathom Resurrection life or maturity in Christ apart from these other travelers. I have to admit…I was hoping for something more. I was hoping Peterson was going to wow me with some truth that would suddenly bring me to a new understanding of the Resurrection…something that would fix this longing I have. He doesn’t. He points us to what God is doing in our midst…and just like the surprise and mystery of the Crucifixion and Resurrection redeeming us….there is mystery in how the Church will be the place we will encounter God and be transformed. It doesn’t usually happen in a flash and in some spectacular way. God works in subtle ways and with patience. Still…the Spirit is stirring something within me. I love my fellowship…I love worshipping together and I love interacting. Still, I do not know that I have fully grasped the reality that this is the place…this is the structure…for my maturity to establish. How about you? Does this spark your imagination for Church, or does it just irritate you because the expectation is too high? Does it ring true that God would work in a Church in the same way He came in the Incarnation…surprisingly humble and not in great power and show? What does this mean for us when we gather together next? How do we internalize these truths in a way that impacts our approach to being part of the Church? Messy Monday…meet intention, countered by 2 year olds. This is my kitchen table…built by a friend. Not a pedestal table, like the one we had for 16 years and loved…but found out is not so great when trying to do homework. Pedestal tables tend to bend and bounce when kids lean on them as they do their work. Plus, our last table only had four chairs. That means for the last five years one person had to sit in a folding chair. Sometimes it takes us awhile to update around here. I love this new table. I love that it was made by someone we know, and I love that it is big enough for more than just us. There is room for friends…we have a bench with it that we can sit three more folks, or kiddos, on. I actually did not really mean to just write about the table…but more about what it is on the table. I am ready for a day of school. The plans are set for the week. The books are readily at hand. Pencils are sharpened and paper is ready. The plan has been made. The sun is shining and the birds are chirping…and everything is in place for a great Monday morning. The coffee even tastes good. What you cannot tell from this window is that every five minutes or so Little Miss is hollering at me from her crib. Nope…she is not supposed to be up. She does not normally wake up for another two hours. Last night I stayed up late getting everything ready for today…so I could awaken early and peacefully enjoy a cup of coffee and some time in prayer. I am ignoring my almost 2 year old to have a few minutes. She is okay, trust me…I know her Dad checked on her at 5am when her diaper had leaked and changed her and gave her a clean sheet. She is okay to holler for a few more minutes. I am attempting to follow through on the promptings of the Spirit to live a more intentional life. I tend to live a bit by the seat-of-my-pants. That means I tend to be frustrated because I have not put things in order to set up for a good day. Even, however, when all is set and the birds are chirping and the sun is shining and the books look inviting….someone will pee themselves and make a mess and then not go back to sleep. The dog will get sick on the carpet. Someone will wake up in a bad mood. Someone will lose a job. Someone will have a terrifying health scare and end up in the hospital. All of these things have happened to friends or ourselves in the last three days. Surprising, unexpected twists that throw our intentional approach askew. Messy Mondays. Or Tuesdays, Wednesdays, Thursdays, Fridays, Saturdays or Sundays. But you know what? Listen to what I heard in church yesterday…. God is the source of my salvation and He is my fortress. I will not be shaken…not because I am strong and have an answer for everything…but because He is my rock and salvation. Power belongs to God. That speaks to my soul today. He is unfailing in His love…needed to hear that as well. He is just and knows our hearts. Psalm 62…read the rest of it and think of the rest and confidence we can have in God. Doesn’t matter what the twist is that has happened. God is able and He is our fortress. From the trivial interruptions of little ones who throw our plans askew, to the live changing, devastating challenges….God is power, He is unfailing in His love and He is aware of us. The intentional approach is good…and a great foundation, but grace is needed for the interruptions and the unexpected. Resurrection life…knowing that Life comes from outside ourselves and does not depend on us. On Messy Mondays or Sundays filled with song.